Built by Herod the Great as his summer palace (22 B.C. ), Caesarea Maritima or "Caesarea by the Sea" became the capital of Roman government in the region for 500 years. It's harbor is a famous engineering feat. But the location of the city would not have been possible without another architectural marvel, the amazing aqueduct which brought water from a spring at the base of Mount Carmel over 10 miles away. 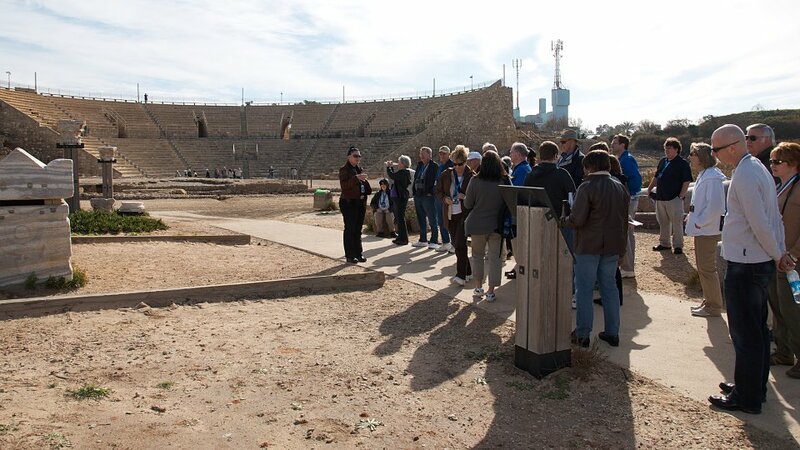 Today, visitors can still see glimpses of the great Roman city of Caesarea in the ruins of the palace, aqueduct and the huge ocean-side theatre. But for Christians, Caesarea also holds a special significance as a cradle of the early church. We remember that Paul spent two years in prison here (Acts 23:22-26:32). Peter came here on many occasions (Acts 10; Act 12:19). 24: And the morrow after they entered into Caesarea. And Cornelius waited for them, and had called together his kinsmen and near friends. 15: Now therefore ye with the council signify to the chief captain that he bring him down unto you to morrow, as though ye would inquire something more perfectly concerning him: and we, or ever he come near, are ready to kill him. 20: And he said, The Jews have agreed to desire thee that thou wouldest bring down Paul to morrow into the council, as though they would inquire somewhat of him more perfectly. 33: Who, when they came to Caesarea, and delivered the epistle to the governor, presented Paul also before him. 24:1: And after five days Ananias the high priest descended with the elders, and with a certain orator named Tertullus, who informed the governor against Paul. 16: And herein do I exercise myself, to have always a conscience void of offence toward God, and toward men. 25: And as he reasoned of righteousness, temperance, and judgment to come Felix trembled, and answered, Go thy way for this time; when I have a convenient season, I will call for thee. 25:1: Now when Festus was come into the province, after three days he ascended from Caesarea to Jerusalem. 3: And desired favour against him, that he would send for him to Jerusalem, laying wait in the way to kill him. 4: But Festus answered, that Paul should be kept at Caesarea, and that he himself would depart shortly thither. 5: Let them therefore, said he, which among you are able, go down with me, and accuse this man, if there be any wickedness in him. 6: And when he had tarried among them more than ten days, he went down unto Caesarea; and the next day sitting on the judgment seat commanded Paul to be brought. 7: And when he was come, the Jews which came down from Jerusalem stood round about, and laid many and grievous complaints against Paul, which they could not prove. 8: While he answered for himself, Neither against the law of the Jews, neither against the temple, nor yet against Caesar, have I offended any thing at all. 9: But Festus, willing to do the Jews a pleasure, answered Paul, and said, Wilt thou go up to Jerusalem, and there be judged of these things before me? 10: Then said Paul, I stand at Caesar's judgment seat, where I ought to be judged: to the Jews have I done no wrong, as thou very well knowest. 11: For if I be an offender, or have committed any thing worthy of death, I refuse not to die: but if there be none of these things whereof these accuse me, no man may deliver me unto them. I appeal unto Caesar. 12: Then Festus, when he had conferred with the council, answered, Hast thou appealed unto Caesar? unto Caesar shalt thou go. 13: And after certain days king Agrippa and Bernice came unto Caesarea to salute Festus. 15: About whom, when I was at Jerusalem, the chief priests and the elders of the Jews informed me, desiring to have judgment against him. 16: To whom I answered, It is not the manner of the Romans to deliver any man to die, before that he which is accused have the accusers face to face, and have licence to answer for himself concerning the crime laid against him. 17: Therefore, when they were come hither, without any delay on the morrow I sat on the judgment seat, and commanded the man to be brought forth. 19: But had certain questions against him of their own superstition, and of one Jesus, which was dead, whom Paul affirmed to be alive. 20: And because I doubted of such manner of questions, I asked him whether he would go to Jerusalem, and there be judged of these matters. 21: But when Paul had appealed to be reserved unto the hearing of Augustus, I commanded him to be kept till I might send him to Caesar. 22: Then Agrippa said unto Festus, I would also hear the man myself. To morrow, said he, thou shalt hear him. 23: And on the morrow, when Agrippa was come, and Bernice, with great pomp, and was entered into the place of hearing, with the chief captains, and principal men of the city, at Festus' commandment Paul was brought forth. 24: And Festus said, King Agrippa, and all men which are here present with us, ye see this man, about whom all the multitude of the Jews have dealt with me, both at Jerusalem, and also here, crying that he ought not to live any longer. 25: But when I found that he had committed nothing worthy of death, and that he himself hath appealed to Augustus, I have determined to send him. 26: Of whom I have no certain thing to write unto my lord. Wherefore I have brought him forth before you, and specially before thee, O king Agrippa, that, after examination had, I might have somewhat to write. 27: For it seemeth to me unreasonable to send a prisoner, and not withal to signify the crimes laid against him. 3: Especially because I know thee to be expert in all customs and questions which are among the Jews: wherefore I beseech thee to hear me patiently. 5: Which knew me from the beginning, if they would testify, that after the most straitest sect of our religion I lived a Pharisee. 7: Unto which promise our twelve tribes, instantly serving God day and night, hope to come. For which hope's sake, king Agrippa, I am accused of the Jews. 8: Why should it be thought a thing incredible with you, that God should raise the dead? 9: I verily thought with myself, that I ought to do many things contrary to the name of Jesus of Nazareth. 10: Which thing I also did in Jerusalem: and many of the saints did I shut up in prison, having received authority from the chief priests; and when they were put to death, I gave my voice against them. 11: And I punished them oft in every synagogue, and compelled them to blaspheme; and being exceedingly mad against them, I persecuted them even unto strange cities. 13: At midday, O king, I saw in the way a light from heaven, above the brightness of the sun, shining round about me and them which journeyed with me. 15: And I said, Who art thou, Lord? And he said, I am Jesus whom thou persecutest. 18: To open their eyes, and to turn them from darkness to light, and from the power of Satan unto God, that they may receive forgiveness of sins, and inheritance among them which are sanctified by faith that is in me. 20: But shewed first unto them of Damascus, and at Jerusalem, and throughout all the coasts of Judaea, and then to the Gentiles, that they should repent and turn to God, and do works meet for repentance. 21: For these causes the Jews caught me in the temple, and went about to kill me. 23: That Christ should suffer, and that he should be the first that should rise from the dead, and should shew light unto the people, and to the Gentiles. 24: And as he thus spake for himself, Festus said with a loud voice, Paul, thou art beside thyself; much learning doth make thee mad. 25: But he said, I am not mad, most noble Festus; but speak forth the words of truth and soberness. 26: For the king knoweth of these things, before whom also I speak freely: for I am persuaded that none of these things are hidden from him; for this thing was not done in a corner. 27: King Agrippa, believest thou the prophets? I know that thou believest. 28: Then Agrippa said unto Paul, Almost thou persuadest me to be a Christian. 29: And Paul said, I would to God, that not only thou, but also all that hear me this day, were both almost, and altogether such as I am, except these bonds. 31: And when they were gone aside, they talked between themselves, saying, This man doeth nothing worthy of death or of bonds. 32: Then said Agrippa unto Festus, This man might have been set at liberty, if he had not appealed unto Caesar. Surely many mighty works and testimonies to Christ occurred at Caesarea. One cannot help but reflect on Paul's voyages from Caesarea and the spread of the gospel to the Gentiles. Remember the words that were spoken concerning Christ by Simeon to Mary and Joseph in Luke 2. Truly Christ is the light unto all nations.